River City Folk is an engaging mix of live performances, interviews and recordings. Hosted by veteran singer-songwriter Tom May, each program features a folk artist or group from North America performing live in the studio. Through Tom's interview with the artists, and samplings from the recordings that have influenced them, the listener is treated to a unique perspective on the living tradition that is folk music. 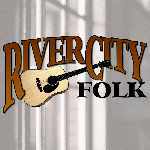 River City Folk remains one of the premier showcases for acoustic singer/songwriters nationally. The program highlights the vitality of the acoustic music scene by featuring diverse performers and styles.